India led the world with an estimated one quarter (26%, up from about 20% in previous years) of all TB cases, and China and India combined accounted for 38% of the global cases in 2010, according to the World Health Organization 2011 report titled "Global Tuberculosis Control 2011". The top five countries with the largest number of reported cases in 2010 were India (2.0 million–2.5 million), China (0.9 million–1.2 million), South Africa (0.40 million–0.59 million), Indonesia (0.37 million–0.54 million) and Pakistan (0.33 million–0.48 million). The good news the WHO report offers is that TB rates are dropping for the first time. The number of TB cases fell from a high of 9 million in 2005 to 8.8 million in 2010. TB deaths dropped from 1.8 million in 2003 to 1.4 million in 2010, and the death rate plummeted 40% from 1990 to 2010. Cure rates are high -- in 2009, 87% of people who had TB were cured, but the report also found that a third of likely TB cases are never notified, so it's not known if those people were diagnosed and treated. A number of countries have shown that the extra focus on fighting the disease pays off. Kenya, Tanzania and Brazil have all seen TB rates decline in the last 10 to 20 years. China's progress has been substantial, with death rates dropping by almost 80% from 1990 to 2010. The frequency of TB was also cut in half in that time. 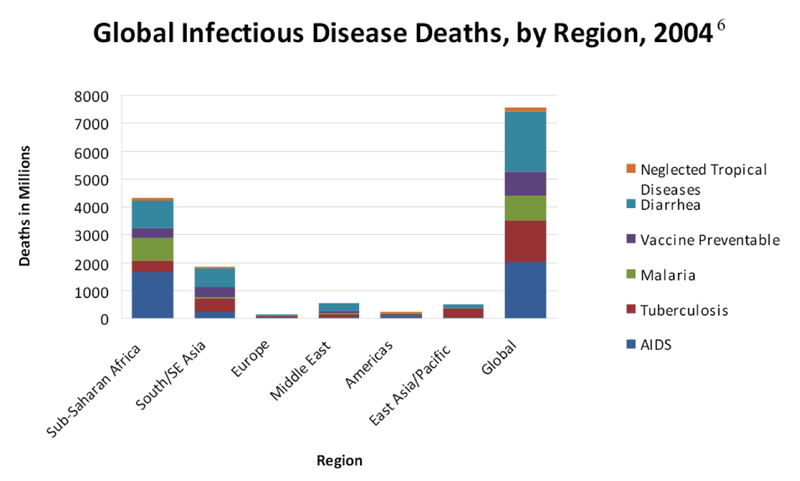 Beyond TB, infectious diseases like malaria and dengue fever continue to take a heavy toll in developing nations. Over the past two months, dengue fever has killed 202 people in Pakistan and another 12,000 have been infected, according to Pakistani health officials. India has reported about 28,500 cases of malaria and at least 10 deaths in New Delhi, Andhra Pradesh, Haryana and Mumbai cumulatively this year. In India's Gujarat State 8228 cases have been confirmed in the last few weeks. Recent research shows that there are potentially far reaching negative consequences for nations carrying high levels of disease burdens causing lower average intelligence among their current and future generations. According to the UNM study's author Christopher Eppig and his colleagues, the human brain is the “most costly organ in the human body.” The Newsweek article adds that the "brainpower gobbles up close to 90 percent of a newborn’s energy. It stands to reason, then, that if something interferes with energy intake while the brain is growing, the impact could be serious and longlasting. And for vast swaths of the globe, the biggest threat to a child’s body—and hence brain—is parasitic infection. These illnesses threaten brain development in several ways. They can directly attack live tissue, which the body must then strain to replace. They can invade the digestive tract and block nutritional uptake. They can hijack the body’s cells for their own reproduction. And then there’s the energy diverted to the immune system to fight the infection. Out of all the parasites, the diarrheal ones may be the gravest threat—they can prevent the body from getting any nutrients at all". A detailed WHO report on World Health Statistics for 2010 assesses and compares its member nations on the basis of nine criteria including mortality and burden of disease, cause-specific mortality, selected infectious diseases, health service coverage, risk factors, health workforce-infrastructure, health expenditures and demographic and socioeconomic statistics. It shows that both India and Pakistan have some serious challenges to overcome to have any chance of meeting health-related Millennium Development Goals (MDGs 4, 5 and 6). Anon: "Riaz if you check your own figures Pakistan has more TB cases on a per capita basis..."
Depending on which end of the range you compare, the per capita rates are about the same or slightly higher in Pakistan. And the overall disease burden in Pakistan is lower, according to WHO data. It's also clear from the WHO data that Pakistan is doing a bit better than India in 12 out of 14 disease groups ranging from diarrhea to heart disease to intentional injuries, and it is equal for the remaining two (Malaria and Asthma). I think we are giving too much importance to international organization. I think there are lot of errors in the way in which the data is collected, collated and publish. As for as the health concern is concerned, india has to go a long way as the bpl itself is very high. Satwa: "Please go through the data which sounds illogical. HOw can the death rate be more than 1000 when the calculation itself is for a base of 1000"
You are not reading it correctly. 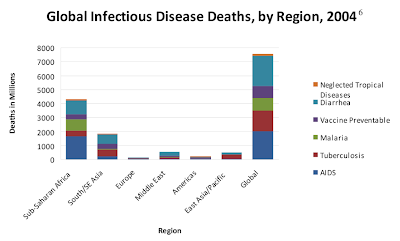 1695 means 1.695 million deaths in India. And 423 means 423,000 deaths in Pakistan. It just shows Pakistan has higher infant mortality rate than India based on these 2004 figures. On comparision on this base, it is 0.15% for india and 0.23% for pakistan. U.S. Ambassador to Pakistan Cameron Munter Thursday highlighting Pak-US cooperation in science and technology said that it has trained more than 100 doctors nationwide, and treated more than 2,000 patients remotely through the use of cutting-edge technology. During his visit here Thursday the Ambassador and his wife Marilyn Wyatt met with the faculty and students of the Rawalpindi Medical College at Holy Family Hospital’s telemedicine facility, working together with U.S. hospitals. On one side of the battle are the countless swarms of mosquitoes that thrive in Pakistan's steamy summer months. On the other, vast quantities of hungry fish conscripted into a fight against a deadly virus that is reaching epidemic proportions. Authorities battling the menace of Dengue virus claim to have turned the tide against the mosquitoes that carry the disease with the help of 1.6m fish released this year into pools, puddles, fountains and any other potential insect breeding places they can find. Punjab has waged an all-out campaign against Dengue – a potentially lethal disease spread by mosquito bites – since a major outbreak in 2011 infected tens of thousands and killed more than 300 people. Software designers were tasked to make smartphone apps to track outbreaks, the government cracked down hard on anyone who left old tires in areas where they could collect rainwater, and areas of stagnant water were doused with tons of noxious chemicals. But it's the release of huge numbers of fish, even into water that soon evaporates, that many credit with helping to beat back the disease, which is now surging in other areas of the country. "It's much better than chemicals that poison the environment," said Dr Mohammad Ayub, the director general of Punjab's fisheries department. "And anyway, chemicals soon get washed away by the rain." A typical target the Punjab's fish team is an acre of murky water that forms every year in a depression squeezed between a flyover and brick factory in an unlovely outskirt of Lahore. It is one of the hundreds of glorified puddles that fill during the monsoon season that are of little interest to anyone apart from wallowing water buffalos that make their home there. Every few months a team led by a white bearded technician in an lab coat return to the pool, test the water and then release up to a thousand voracious tilapia fish from giant plastic bags partially inflated with oxygen. Immediately on their release the surface of the water ripples with fish rising to gobble insects and the larvae that would otherwise quickly mature into mosquitoes. The war on mosquitoes has demanded a significant effort by Punjab's fisheries department, which runs hatcheries to breed the vast quantities of fish seed required to keep mosquitoes at bay. The effect has been dramatic with just over 100 cases reported in Punjab this year, compared with 20,000 in 2011. Officials say it has also curbed other pests, not just the Aedes mosquito that carries Dengue. "Previously people could not sit outside in evenings on lawns but now they can sit comfortably because there are no mosquitoes," said Ayub. Pakistan’s government launched a national health insurance program for its poorest households Thursday, marking the start of the most-ambitious public health project in the country’s history. The Prime Minister’s National Health Program will from Thursday cover families that make less than $2 a day through a gradual rollout. In the first phase, over 3 million families will get health insurance in 23 districts, with the ultimate aim to cover 22 million households across the country, officials said. “This is another step towards the welfare state that we promised to create when we came into power,”said Pakistani Prime Minister Nawaz Sharif. The Pakistani government already subsidizes health care to varying degrees in public hospitals, but officials acknowledge these facilities are unable to handle the patient load or achieve public health targets. The government said earlier this year that it wouldn’t be able to meet the United Nation’s targets for child and maternal mortality rates that formed part of the Millennium Development Goals, which had a deadline of 2015. Critics have blamed Pakistan’s low health spending and inadequate management as key factors in the poor health provision. Between July 2014 and March 2015, Pakistan spent just 0.42% of its GDP on health. The U.S. government spends about 8.3% of GDP on healthcare. The new insurance program will cover treatment at both public and private hospitals. Private hospitals that sign up will then be offered loans on easy terms to upgrade their facilities, officials said, without providing further details about interest rates and conditions. Saira Afzal Tarar, minister of state for health Services, regulations and coordination, said most Pakistanis pay out of pocket for treatment. “There is treatment at government-run hospitals, but there are long lines. Those who don’t have a recommendation have to wait months for treatment,” Ms. Tarar said at the launch ceremony in Islamabad. “With this [health insurance] card, you’ll be able to go to the hospitals where you weren’t allowed to even go to the front door. Now, you’ll be treated there with dignity and respect.” Ms. Tarar said. The national health program, with an initial funding of 9 billion Pakistani rupees ($86 million) will pay for the treatment of the types of illnesses identified by the government as critical: heart disease, diabetes and related illnesses, cancer, kidney and liver diseases, complications from infections like HIV and Hepatitis, road accidents, and burn injuries. Officials said coverage can be extended to other conditions considered life-threatening. The government said Thursday that the program will be run in partnership with provincial governments, which will share the financial burden. Beneficiaries will receive insurance cards, after selection from a database of low-income Pakistanis set up in 2008 for a separate cash support program. The coverage includes 50,000 rupees for general treatment, and 300,000 rupees for serious illnesses. Mr. Sharif said on Thursday that the government is making arrangements for an emergency fund that would extend coverage to 600,000 rupees for cases that require longer treatment. Officials on Thursday didn’t provide specific timelines for the rollout of the next phase, which is expected to cover another 3.3 million households. The finance ministry said earlier this year that the program aims to cover 22 million families. The finance ministry, quoting World Bank data and 2008 population estimates, said last year that if living on $2 a day is taken as the poverty line, over 60% of the population would fall in that category.